The real deal. This recipe was given to me by one of my husband’s co-workers. Combine the dressing ingredients, let stand 1-2 hours (or up to 4 hours). Wash the lettuce and pat dry. Toss with dressing just before serving. Add croutons if desired. In a small bowl stir together flour, baking powder and soda. In mixer, cream together butter and sugar until smooth. Beat in egg and vanilla. Gradually stir in dry ingredients. Add enough buttermilk to moisten dough, make it soft, not wet. Roll rounded teaspoons of dough into balls on an ungreased cookie sheet. With a brush or fingers, moisten the top of each cookie with remaining buttermilk and slightly flatten. Sprinkle with sugar. Bake for 8-10 minutes or until slightly golden. Let stand 2 minutes before removing to racks to cool. Adapted from Veganomicon by Isa Chandra Moskowitz & Terry Hope Romero. New York, NY: Marlowe & Company, 2007. I love this dish served over polenta. Preheat a large saute pan over medium heat. Saute the garlic in the oil until just starting to brown. Add the red pepper flakes, stir. Add the escarole and salt to taste. Using tongs, toss the escarole until it begins to wilt. Add the beans and the capers and cook until heated through (about 3 minutes). Remove from the heat and squeeze on a little lemon juice. Serve with additional lemon wedges. Combine the vegetables, except the scallions and tomatoes, olive oil and salt and pepper and grill over moderately high heat. We placed them on a cookie sheet on the grill so we didn’t lose the pieces. The vegetables should be cooked through and browned. This will take about 20 minutes. In the meantime, cook the pasta. Drain the pasta and put it back in the pot with the fresh tomatoes and scallion. Add the roasted vegetables and a little butter it seems dry. Toss, add the basil and the fresh mozzarella, if using, and toss again. My cousins came to visit one summer toting this cake. Yum. The recipe is from Epicurious.com. Preheat oven to 325˚F. Grease & flour 13x9x2-inch baking pan. In a medium bowl combine flour,cocoa, baking soda and salt. Beat sugar, butter and oil in a large bowl of an electric mixer until well blended. Add eggs, 1 at a time, beating well after each addition. Beat in vanilla extract. Mix in dry ingredients alternating with buttermilk in 3 additions each. Stir in zucchini. Pour into baking pan. Top with chocolate chips & nuts. Bake 50 minutes, until toothpick inserted in center comes out clean. Cool completely in pan. It is zucchini time in the garden. Time to dust off all the many recipes to use this wonderful food. I found this recipe on the Food Network site many years ago. It is delicious. Preheat oven to 350˚F. Grease & flour a 9×5 loaf pan. In a large bowl stir together the first 8 ingredients, mix well. Add the oatmeal and stir. Make a well in the center. In a small bowl whisk the eggs, oil and vanilla. Pour into well. Fold together. Stir in the zucchini. Do not overmix. Scrape the batter into the loaf pan, mounding the center. Sprinkle with the turbinado sugar. Bake 60-65 minutes, until a toothpick inserted in center comes out clean. Cool in pan 10 minutes, turn onto a rack covered with a clean dish towel to prevent indentations. Cool another 10 minutes before slicing. Another great recipe adapted from Vegetarian Times, February 2009. I know this is the wrong season for this recipe but I plan to use frozen Brussels sprouts this evening to accompany our dinner. Heat a large skillet over medium-high heat. Toast walnuts, set aside. Wipe out skillet, and return to heat. Add olive oil and Brussels sprouts, cook 5 minutes, until browned, stirring occasionally. Add shallots & garlic, cook 1 minute more. Stir in cranberries, maple syrup and 1 cup water. Partially cover skillet, reduce heat and simmer until Brussels sprouts are just tender and most of the water has evaporated (about 5-7 minutes). Place in a serving bowl and sprinkle on toasted walnuts. Season with salt & pepper. Drizzle with walnut oil if desired. 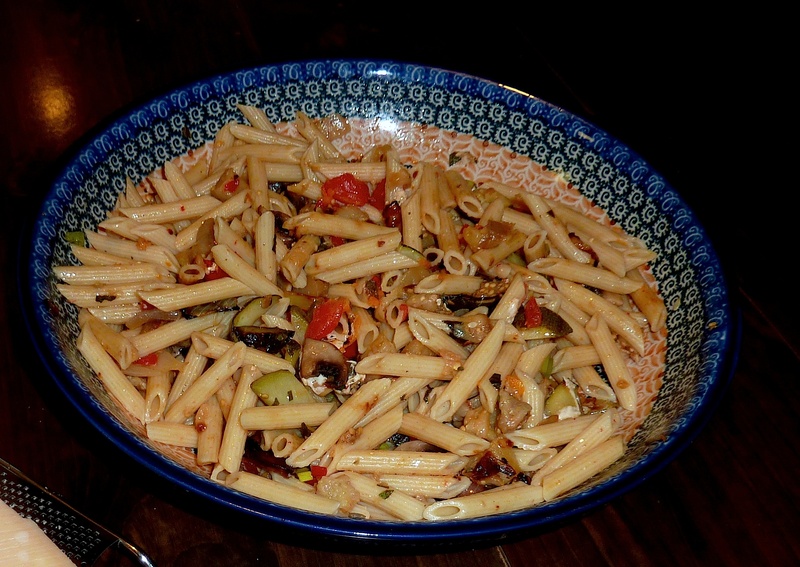 This recipe is adapted from Vegetarian Times, September 2010 issue. These are very time intensive but they are so delicious. Cover with a clean towel, and let stand in a warm place 30 minutes or until mixture is thick and bubbly. Knead 2 or 3 minutes (by hand or with mixer) until dough is smooth. Knead 2-3 minutes more until dough comes together. I find this needs an additional 1/2 cup flour at this point, but the dough should be sticky. Knead (on counter or in mixer) an additional 5-7 minutes until no longer sticky. Punch down, cover and let rise an additional 30 minutes. Shape into approximately 10 2-inch balls. Cover and let rise 30 minutes. Roll balls into 1/4-inch thick circles. Cover and let rise 30 minutes. This bit is a challenge since you can’t stack the rounds or they will stick together. So far the best arrangement is to place them on cookie sheets sprinkled with cornmeal. Brush cast iron skillet with oil, and heat over high heat. Place one circle in pan and cook 1 to 1 1/2 minutes per side, repeat. I use a griddle pan so that I can cook 4-6 at a time. These freeze very well. Microwave them from frozen or if you are patient, wrap them in foil and place in over/toaster oven at 350˚ for 5-10 minutes. I clipped this recipe from the Trenton Times in May of 2006. The recipe says this serves six, however I find it very rich so I would consider those very generous servings. Heat the oil in a large pot over medium heat. Cook the onion and garlic, covered, until softened, about 5 minutes. Add the tomatoes, stock and sweet potatoes. Bring to a boil, then reduce heat and simmer, uncovered, until the potatoes are soft, about 30 minutes. Stir in the peanut butter, curry powder, cayenne and salt. Remove from heat. Puree with an immersion blender (or allow to cool and use a food processor or standard blender). Warm soup to serve, sprinkled with chopped peanuts. Adapted from Simple Vegetarian Pleasures by Jeanne Lemlin. Combine marinade. Pour over tofu and peppers. Marinate up to eight hours, toss occasionally. Place tofu and marinade in a large shallow baking dish, it should be one layer. Bake at 450˚ for 15 minutes, tossing once halfway through cooking. Remove tofu from oven and pour on sauce, toss to coat. Return pan to oven and bake an additional 10 minutes. Remove and let rest 10 minutes.